Most people know about ocean cruises and river cruises, but there is a type of cruising that is truly exceptional and unequaled to all other cruise experiences in both the cruise experience itself and in the ports of call. It is cargo ship cruising. I recently returned from an adventurous cruise on the Aranui 5 cruise ship. This ship is half container ship and half cruise ship. We cruised to the Marquesas Islands – one of the most remote and beautiful island chains in the world. 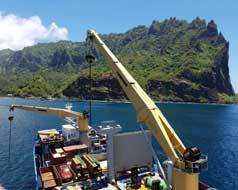 The Ship – The Aranui 5 passenger capacity is 200 plus crew and delivers freight from its home port in Tahiti to the Marquesas Islands. The front half of the ship holds containers and freight. The back half of the ship accommodates passenger quarters. The cabin and passenger areas are similar to what you would find on a typical cruise ship – but the experience is much more noteworthy. The Experience – The Aranui 5 truly captures the spirit of Polynesia. From the crew to the itinerary, you are immersed in the friendly and relaxing atmosphere of Polynesia. The cruise operates much like a river cruise. Because of the unique day-to-day circumstances, you have a daily briefing before dinner to review the next day’s activities and events. Excursions are included in most ports and there are a few optional excursions that have an additional charge. Some of these activities include snorkeling, scuba diving and horseback riding. The ship’s entertainment staff keeps you immersed in the culture with dance classes, craft classes, guest lectures and local entertainment. The Itinerary – The Aranui 5 departs from Papeete, Tahiti and sails to the Marquesas Islands. The Marquesas are located about 1000 miles north of Tahiti. Along the way there are stops in the Tuamotu Islands to break up the distance. These stops include Fakarava and Rangiroa – two beautiful atolls. On the last day there is a stop in Bora Bora, a popular island in the South Pacific that is sought out by many travelers. The highlight of the cruise is visiting the Marquesas Islands. It’s hard to describe the Marquesas Islands because they are so unparalleled to any other island destinations. In short, I would say these islands are similar to the island of Kauai in Hawaii. However, the population on each of these islands ranges between 300 and 2000. So the Marquesas are much less populated than Kauai with a much more remote tropical paradise feel. The whole island chain has a population of less than 9,000. The itinerary visits the six main islands and visits some twice due to cargo operations. The Excursions – Each port includes a distinctive adventure. While the crew unloads the cargo you explore the island. Most excursions include a drive through scenic, untouched areas to cultural points of interest including visits to rare stone tikis, scenic lookouts and interesting villages. Some include lunches that provide authentic dishes cooked in traditional ways. You also experience the traditional dances from each island such as the bird dance, pig dance and more. In some ports, for adventure seekers, you can choose to do a hike in addition to or instead of the drive. During stops in the Tuamotu Islands and Bora Bora, there are optional tours and activities such as swimming with the sharks or bike rentals. In Bora Bora you can enjoy an excursion with lunch served on a private motu (island) where you can swim, snorkel or just relax. My Favorite Activity – One evening on the cruise we had a Polynesian night. The ship sailed to a secluded bay and dropped anchor. We enjoyed the sunset and a delicious Polynesian dinner with local entertainment. One of the most notable parts of this experience was that the crew was invited to participate. The entire ship including passengers and crew were out on deck enjoying a festive atmosphere. It was difficult to decide what I liked best about this experience as the ship was unique, the ports were amazing, the people were friendly and the cultural experience was meaningful. If you are a traveler that’s looking for an unrivalled experience or simply wanting a new adventure, this is a travel experience you will never forget.